Norma Shearer, Joan Crawford and company get their claws out in The Women. 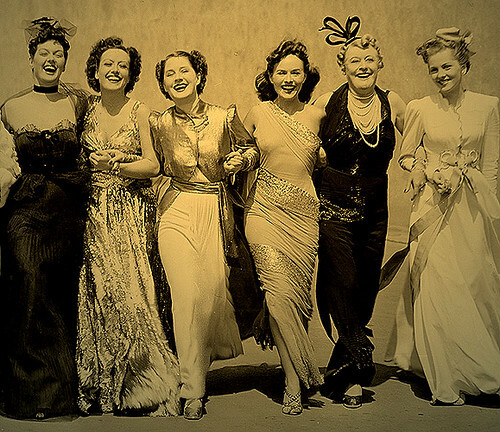 The Stars: Norma Shearer, Joan Crawford, Rosalind Russell, Paulette Goddard, Mary Boland and Joan Fontaine. Source Material: The Broadway play by Clare Boothe Luce. 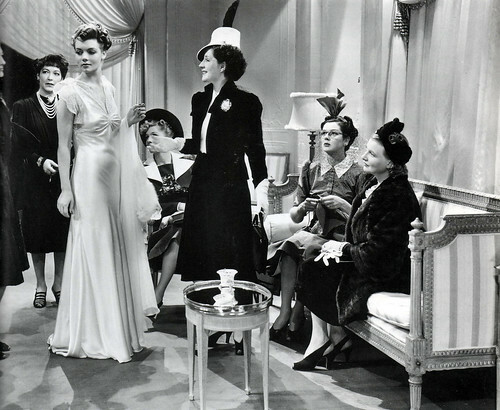 The women of The Women do some gown shopping. The Plot: Socialite Mary Haines (Norma Shearer) believes she has the perfect marriage until she inadvertently discovers that her husband is seeing a perfume counter girl, Crystal Allen (Joan Crawford). Mary receives conflicting advice from her gaggle of high society friends, who have their own romantic troubles. 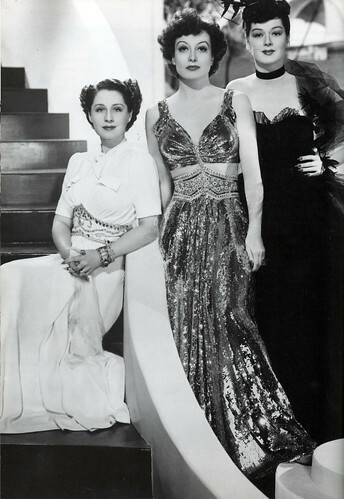 The stars of The Women: Norma Shearer, Joan Crawford and Rosalind Russell. Backstory: Luce's Broadway play was a smash hit, so it's no surprise that MGM snapped up the rights for Shearer, who was then queen of the lot thanks to her marriage to all-powerful producer Irving Thalberg. Screenwriter Jane Murfin did run into trouble with the censors while adapting Luce's risque dialogue so Murfin's fellow screenwriter Anita Loos was brought in to re-fashion the racy one-liners into cleaned-up versions that would pass muster with the Hayes office. 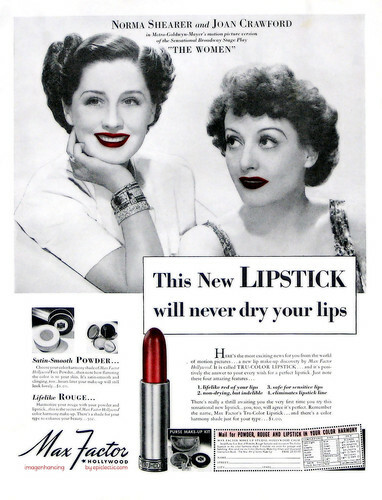 A vintage advertisement featuring Norma Shearer and Joan Crawford. Best Performance: There's a lot to be said for Rosalind Russell, but my vote goes to Joan Crawford as Crystal Allen. Crystal is supposed to be the villain of the piece, but Crawford imbues her with a hard-edged charm that makes it difficult for the audience to root against her. Crawford, who began her movie career in silents, had been playing shop girls who claw their way to the top for the better part of a decade, and its a safe bet that every typist and waitress in the audience was rooting for Crystal to get one over on the high society matrons. Best scene: The confrontation scene between Crystal and Mary crackles with tension thanks to the whip-smart dialogue and Crawford and Shearer's real-life disdain for one another (clip below). Best Line: "He almost stood me up for his wife." Crystal Allen after getting off the phone with Mary's husband. Shearer and Crawford: Norma Shearer and Joan Crawford were two of MGM's brightest stars, but they shared a notorious disdain for each other. They often competed for plum roles, with Shearer, who was married to powerful producer Irving Thalberg, often getting the better parts. Crawford deeply resented this (she was fond of quoting a saying around MGM that "Norma Shearer got the productions, Greta Garbo supplied the art and Joan Crawford paid for both") and their mutual animosity spilled over onto the set of The Women. Shearer's stock at the studio had diminished after Thalberg's untimely death, and Crawford didn't mind showing her disdain for her co-star. Crawford snubbed Shearer by knitting furiously and refusing to look her co-star in the face while she was feeding Shearer lines for her closeups. Shearer got her own back by demanding that Crawford be removed from the set. The pair did finally set aside their squabbling at Cukor's request. Gowns by Adrian: Legendary costume designer Adrian did spectacular work on The Women, designing 237 costumes for the large cast, including five identical outfits for the notorious fight scene at the Reno divorce ranch. Adrian's piece de resistance was the six-minute fashion show, which was filmed in color to showcase the designer's elaborate work. Fun Fact: There are no men in The Women. The entire onscreen cast are female, although most of the characters are obsessed with the male of the species (thus MGM's famous tag line "It's all about men"). Why it's essential: There's a reason why The Women has such a large cult following: the script is exceptionally witty and it's clear that the highly talented cast are enjoying every moment of their juicy roles while swanning around in Adrian's fabulous clothes. Availability: DVD and video on demand. The essentials will take a break next week, but we'll be back on Jan. 26 with Midnight starring Claudette Colbert and Don Ameche.